Every June well into autumn, South Florida experiences hurricane season. During those stormy months your chances of being out on your motorcycle during dangerous weather significantly increases. Knowing how to ride in poor weather is not only convenient, but could save your life! Here are some tips to keep on riding, no matter what weather mother nature throws your way. 1. Avoid slippery roads- If it is actively raining, you are prepared for slick roadways, however if it had just rained or the road hasn’t had a chance to dry out yet from an earlier storm, you may misjudge how slippery the streets are. Also be aware of oil and dirt that may make the road more slick when wet. 2. Don’t allow yourself to get soaked – If you are soaking wet, it will be a lot more difficult for you to concentrate on getting home. It’s best to have rain gear ready during these summer months. When looking for rain gear, make sure the pants cover your entire leg and that the sleeve cuffs keep rain out of your gloves. 3. Know what streets you are riding on – Try to stick to roads you know well. Puddles and heavy rain can mask obstacles you may not see immediately. Rain can also prevent you from seeing potholes and other hazards. By sticking to familiar territory, you reduce that risk. 4. 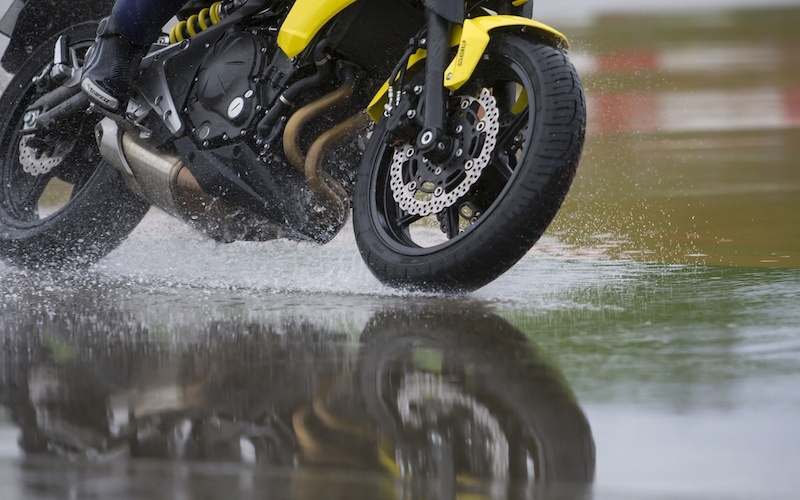 Be prepared to handle hydroplaning – Much like a car, motorcycles are susceptible to hydroplaning. Handle it similarly to how you would handle a car hydroplane, lay off the gas and keep your hands on the grips, maintaining as much control as possible until you get passed the water. 5. Know when to stay off the roads– As always, your best option is to avoid riding during turbulent weather. Especially during hurricane season. However, these tips can help you if you catch yourself out during a storm. It is always upsetting to hear about accidents, especially if they can be avoided. However, sometimes accidents happen. If you find yourself injured by a driver, do not hesitate to learn more about your legal options. Please give us a call at (561) 330-6330 or visit our website at www.florida.law. What motorcycle injuries are most common? What are the dangers associated with fall driving?